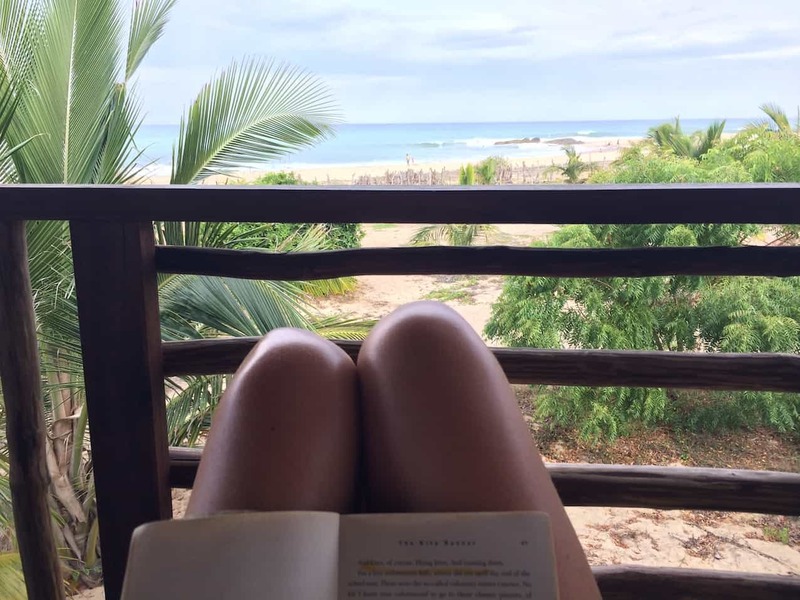 Looking for the best beach cabanas on the East Coast of Sri Lanka? 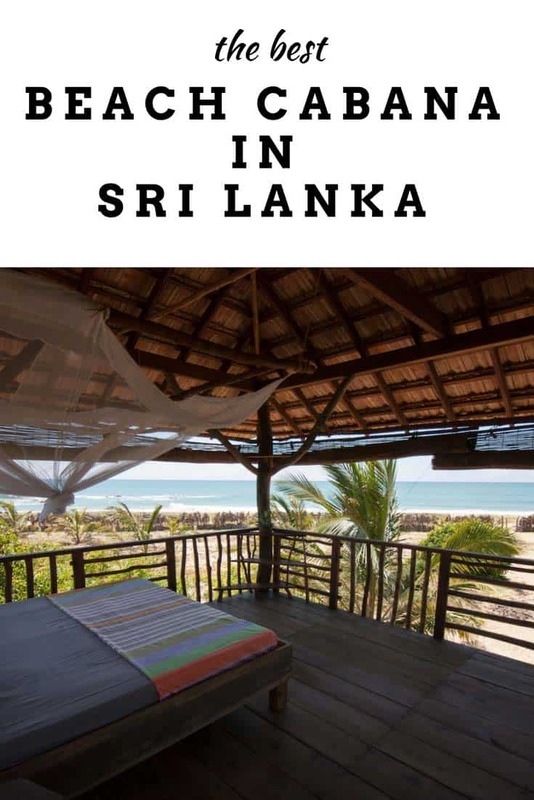 If you’re heading to the East Coast of Sri Lanka with kids, I have the absolute perfect cabana getaway for you. Tree top, open air living with the ocean on your doorstep. 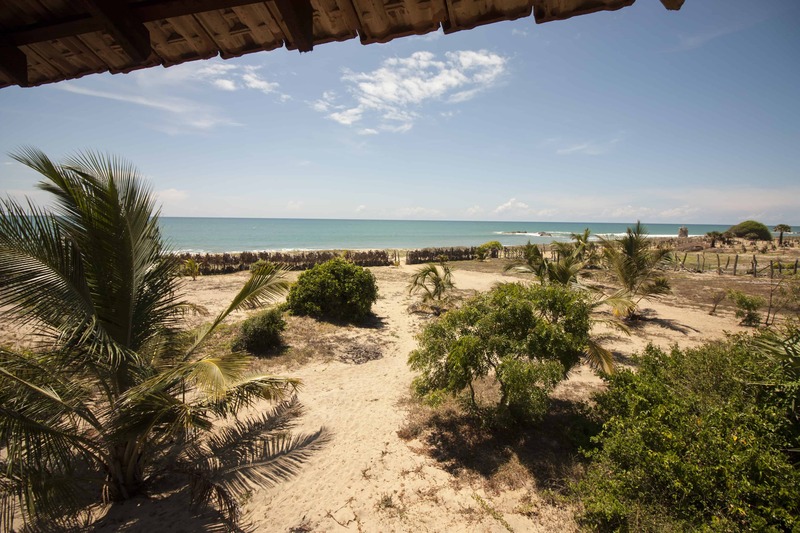 The ultimate getaway for adventurous families, surfers or those who want to get off the beaten track. Possibly one of the best beach cabanas in the whole of Sri Lanka! Hilltop Cabanas feels like a secret. With few visitors it seems like a wonderful, big fat secret that you’ve happened upon. 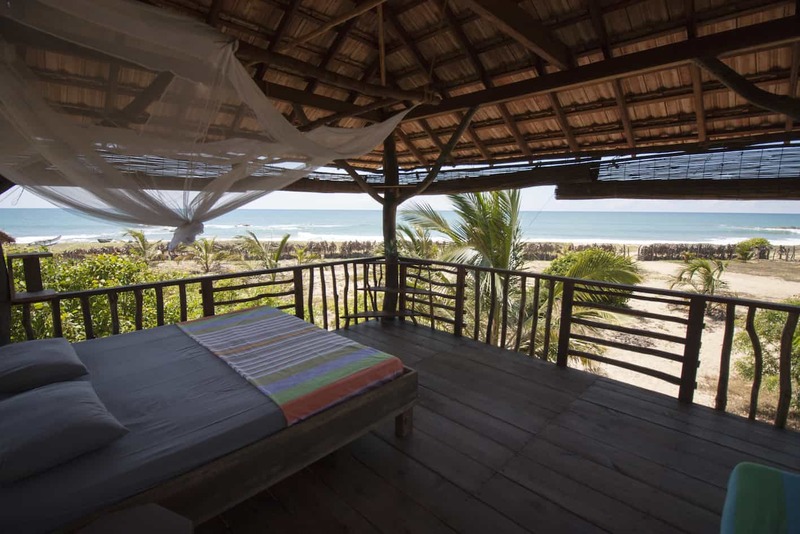 Nestled into the remote beach at Lighthouse Point, Komari (a 30 minute tuk tuk ride North from popular East Coast surf spot, Arugam Bay) Hilltop Cabanas is pure paradise. 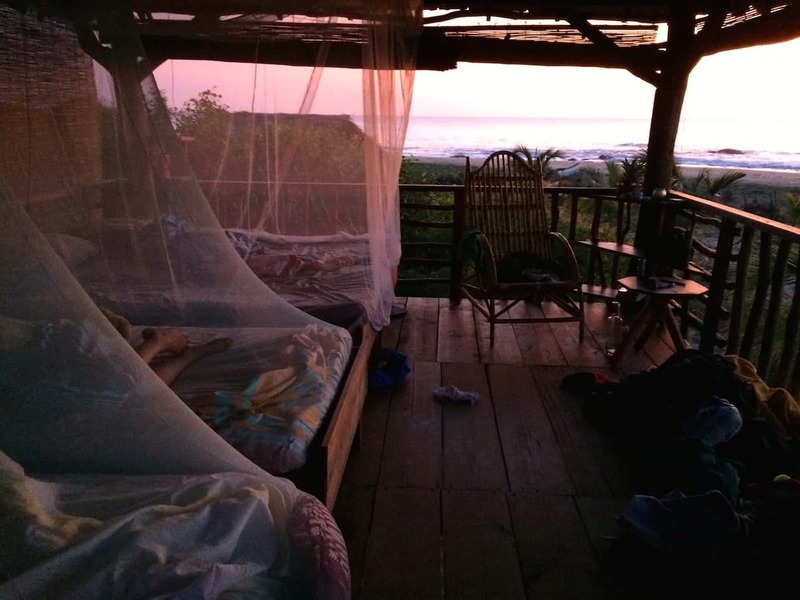 Imagine sleeping out under the stars in a tree top hideaway with the crash of the surf lulling you to sleep. Seven basic, but beautiful, cabanas are set into a lush tropical garden with a pumping surf break and incredible ocean views. 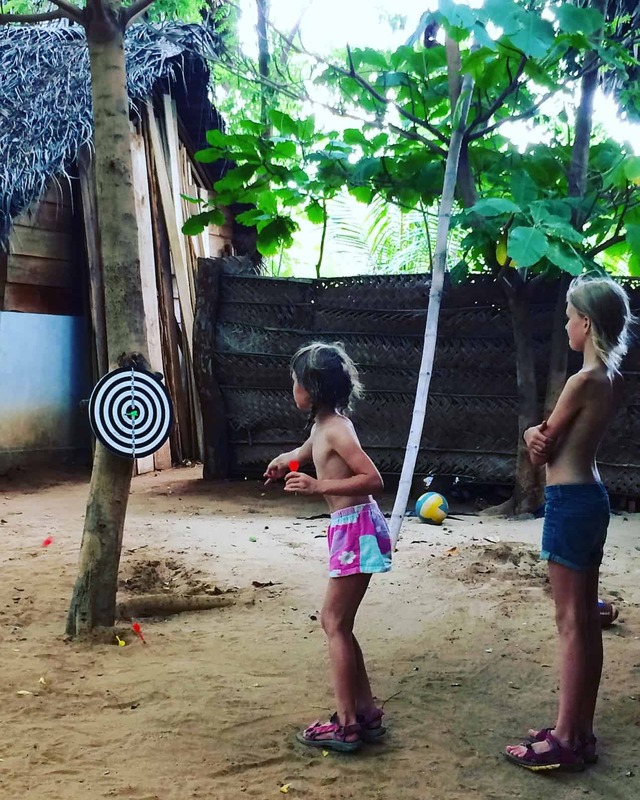 If you’re planning on exploring the East Coat of Sri Lanka with kids, then do yourself a favour and book a cabana here for a night or two. It’s unforgettable. Lighthouse Point is named after an old lighthouse still remaining on the point. 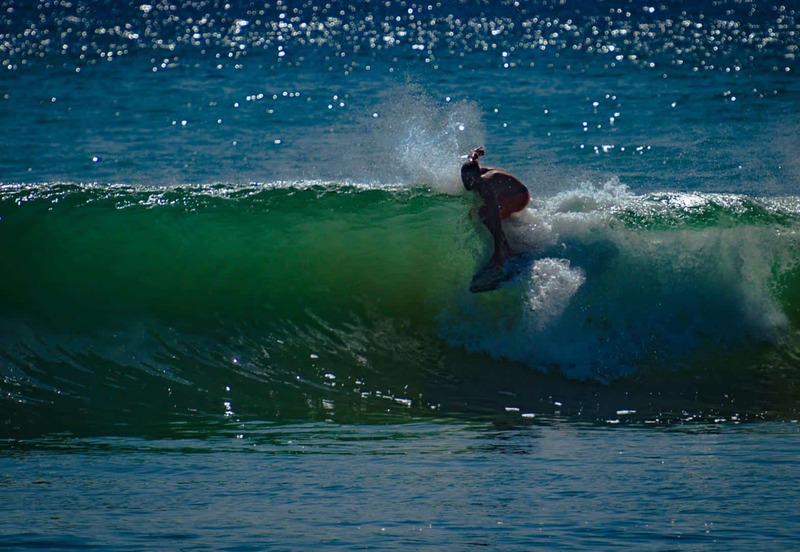 It’s now better known for the surf break opposite it – a good right hander working from July to October – it’s a great spot with barely anyone in the water. Apart from the EPIC location, a great wave and no crowds – we love that Hilltop Cabanas is off grid with a low environmental impact. A super laid back outfit run by a young, friendly, surf loving French trio, Hilltop Cabanas is sustainable living at its best. With solar power rigged up to each cabana (just enough to charge your phone and power a small light at night) and water being drawn and filtered from the on-site well, a stay here is pleasingly self sufficient but not lacking in anyway. 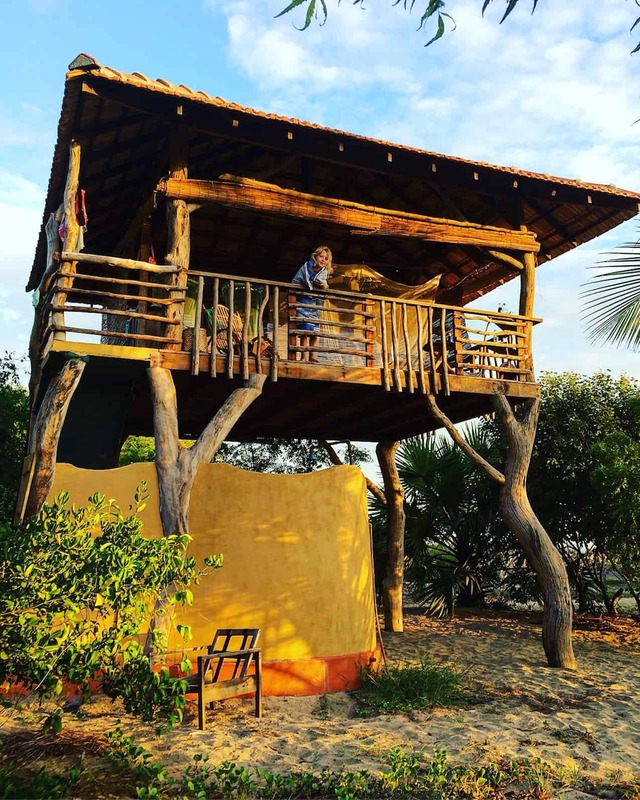 The best beach cabana in Sri Lanka…..
It’s a burly statement but we’re going to go with it (for now!). During our month long Sri Lankan trip this was by far the most exciting and adventurous accommodation we stayed at. We stayed in the largest cabana, the BIG OPEN VIEW which was the closest to the ocean with uninterrupted views. Heaven! Sleeping 4 with with a double and two singles, the Big Open View is perfect for families with older children. Our are 6 and 9 and so the safety aspect of the balcony sides wasn’t an issue for us. Families with toddlers should look at some of Hilltop’s enclosed cabanas. 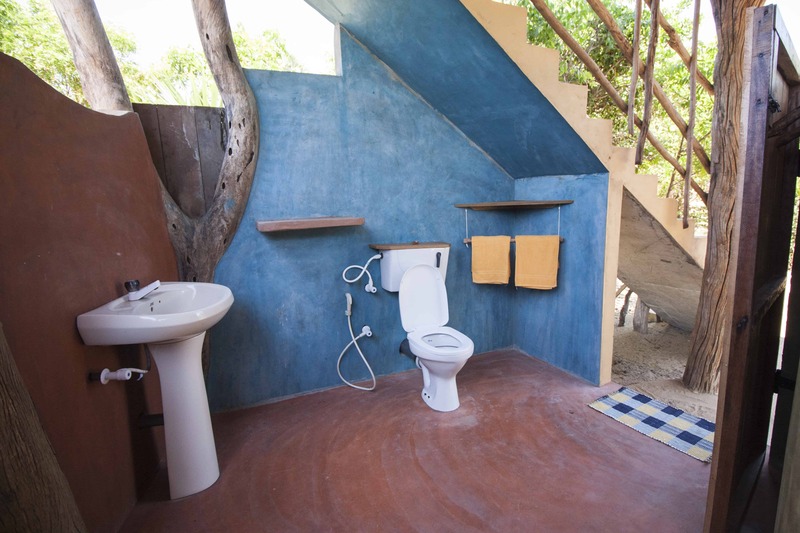 We loved the outdoors bathroom under our cabana! The outdoors en-suite (or rather sous-sol) bathroom beneath us was a winner with the kids. 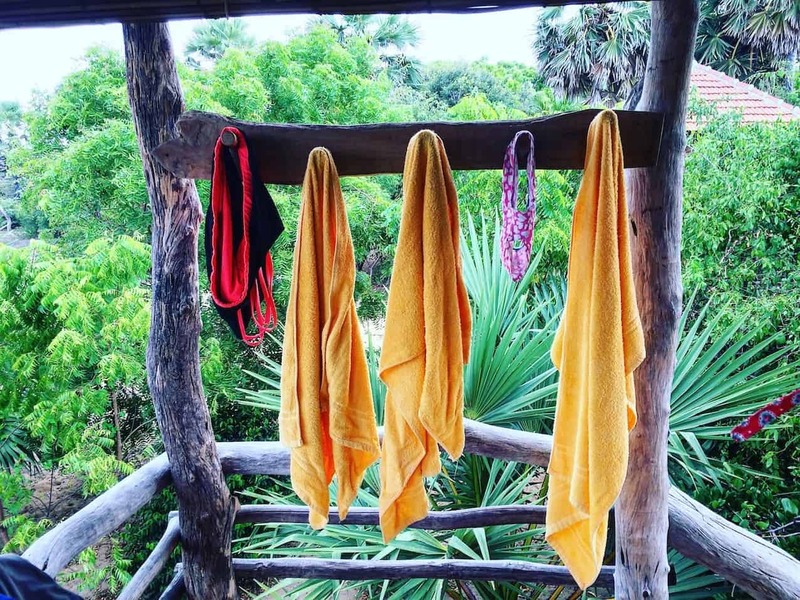 They loved taking a shower in the open, although going to the loo at night was less inviting! The beach is right there. Not even a two minute walk over the hot sand. Bear in mind August is HOT on the East Coast of Sri Lanka. Expect temperatures to be 38-40 degrees. There’s no shade on the beach so plan your day around the heat. Surf or swim from 5-7am and then again at 4pm. In the middle of the day expect to snooze or chill out in your cabana, swing in the hammocks dotted around the site, or play games in the reception/restaurant. Night time falls suddenly in Sri Lanka. Before you know it, it’s pitch black and I mean can’t see the hand in front of your face black! Be prepared – bring a torch for each of you and make sure it’s handy as sunset approaches. 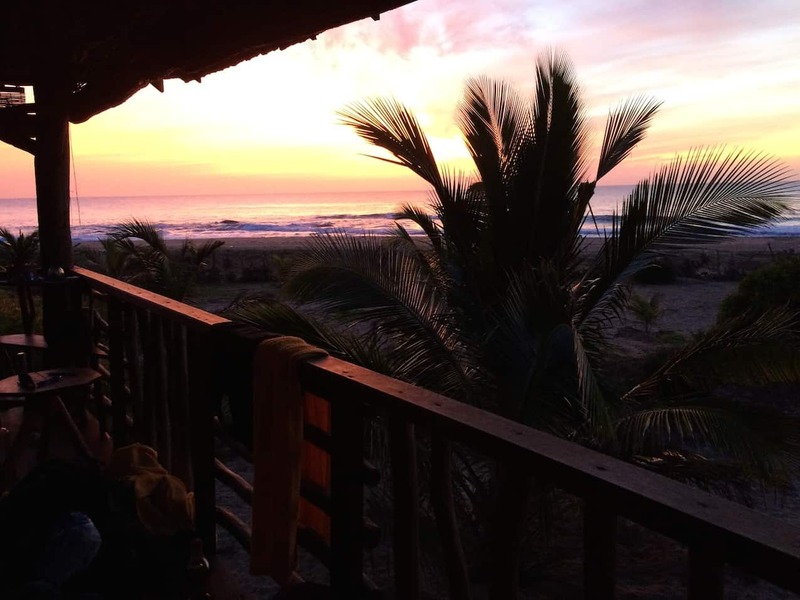 Waking to the crash of the surf and the noise of the animals every morning was enlightening – we felt a real connection with nature and with that a sense of peace and tranquility. To wake with the sun caressing our faces and to see the crimson sky ablaze over the ocean. It’s not something you forget in a hurry. We quickly got into the routine of rising with the sun at 5am, having a surf or walking along the beach (taking advantage of the cooler temperature as by 7am the sand was too hot to walk on with bare feet!). Tree top living doesn’t get any better! Wake up to the sun on your face little one. 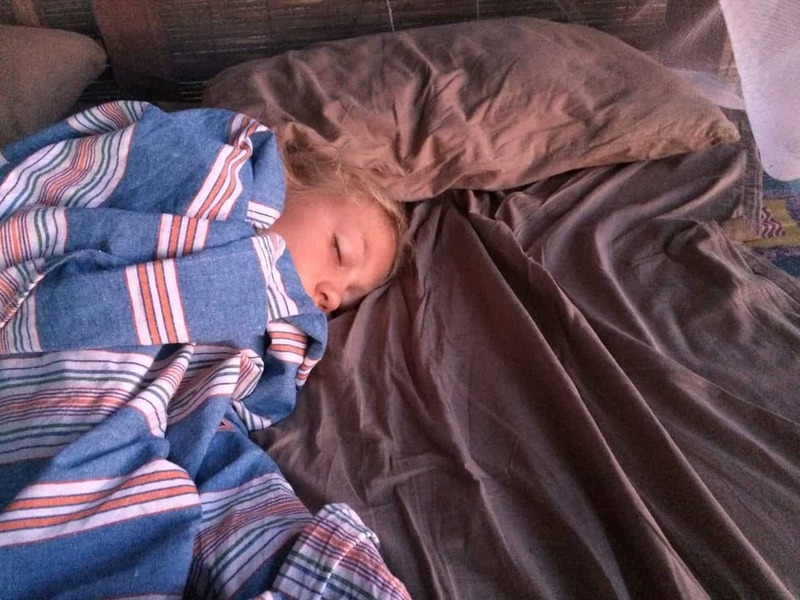 For us the simplicity of life here was a real wake up call. A reminder that only a few basic needs are really required for us to be happy. Because of the reduced electricity supply, devices were kept super minimal and we all enjoyed family bonding playing chess, darts or reading in the various hammocks dotted around the site. There’s even a slack line to try your wobble on. That said families should be warned that there’s not much to do at Lighthouse Point apart from surf and chill. 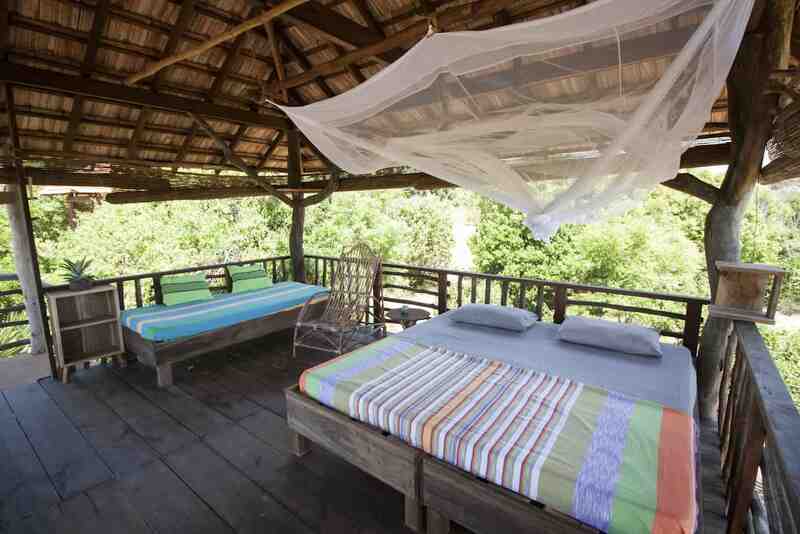 We would recommend a 1 or 2 night stay at Hilltop Cabanas just to try the adventure of the place. The cabanas are solar powered so thankfully devices are pretty much shut down. Darts anyone? Hilltop Cabanas is remote. So unless you’ve rented your own tuk tuk (which is possible in Sri Lanka and which I regret NOT doing on this trip!) you’ll be stuck (oh dear!) in this little slice of paradise. It’s a good job then that you don’t really need to go anywhere. Surf and sand is on your doorstep. Delicious food is available at breakfast and lunchtimes in the on-site open air restaurant and on an evening, a communal dinner is served and shared by all the cabana guests. We loved this. The communal dinner. The girls weren’t too sure of this notion at first. The no choice option. But as we were at the end of our trip, fussiness had long since given way to hunger and it wasn’t a problem. It was a lovely opportunity to meet other travellers and other families on the same tip as us. We found during our month stay on the East Coast of Sri Lanka, that the sea was just too rough most of the time for our kids to safely swim in. Lighthouse Point though has a lovely shallow area that the kids could play in quite safely and they enjoyed looking out from the rocks on the point where you can get up close to the surfing action. 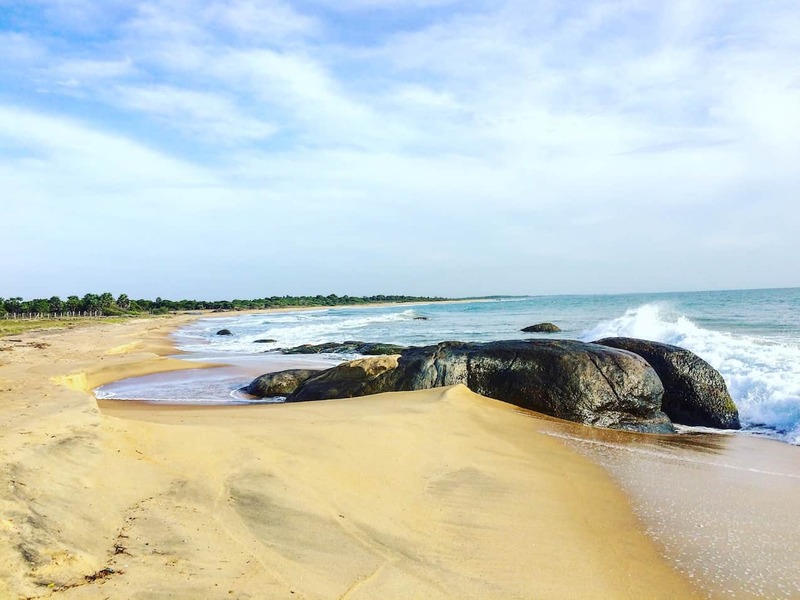 The weather is HOT in August on the East Coast of Sri Lanka so it’s impossible to venture out onto the beach for long periods between 10am – 4pm as there is absolutely no shade on the beach. 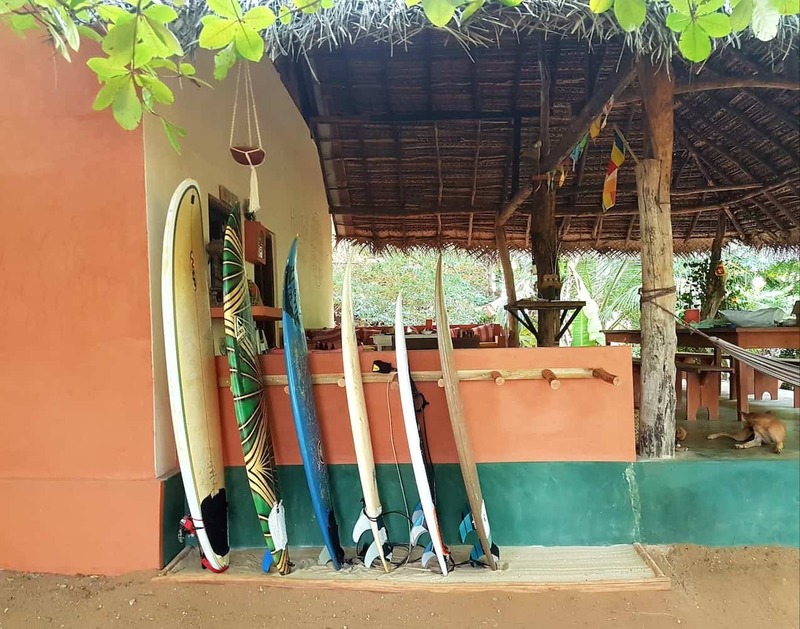 If you’ve been hanging in Arugam Bay, arguably the most famous surf spot on the East Coast of Sri Lanka, for a while, you might have heard of Lighthouse Point. This uncrowded secret spot is home to a consistent, friendly right hander (the East Coast only has right handers!) from July which is perfect for all levels. Lighthouse Point is a good right hander working from July with hardly anyone in the water! Hilltop Cabanas is right on Lighthouse Point, as in you can literally roll out of bed and into the waves. You’ll most probably be in the surf with your hosts, Romain and Guillaume, who are happy to give you the low down on the break. If your other half is as surf mad as mine, this place is a godsend. I happily read a book on my cabana perch and was able to spot him riding the waves with the naked eye! A rare and wonderful thing. Being able to read a book at the cabana and watch your husband surf is pretty cool! Lighthouse Point is in Komari, 25 kilometres North of Arugam Bay. A tuk tuk from Arugam Bay takes around 30 minutes and is approximately 1700LKR one way. 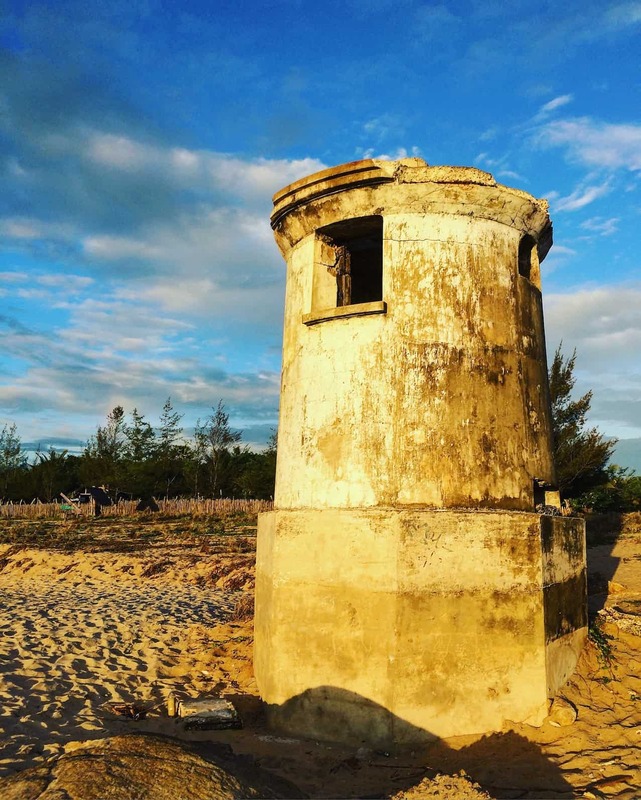 What to make sure you’ve packed before heading to Lighthouse Point? RIMMED HAT – there’s no shade on the beach. SUNSCREEN – as above – there’s no shade on the beach! 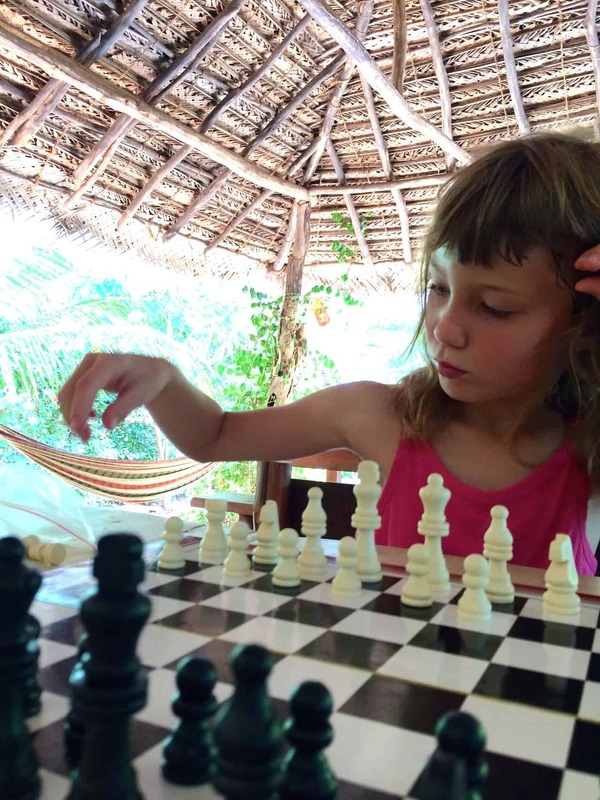 GAMES & BOOKS – Hilltop Cabanas do have a good selection of games (chess/backgammon/cards etc). There’s not much to do apart from surf and chill so bring something to occupy you in the heat of the day. CASH – Hilltop Cabanas does not have a card machine so bring hard cash to pay the bill. INSECT REPELLENT – we weren’t bitten that much here as the ocean breeze does reduce the number of mozzies but bring your spray with you anyway! 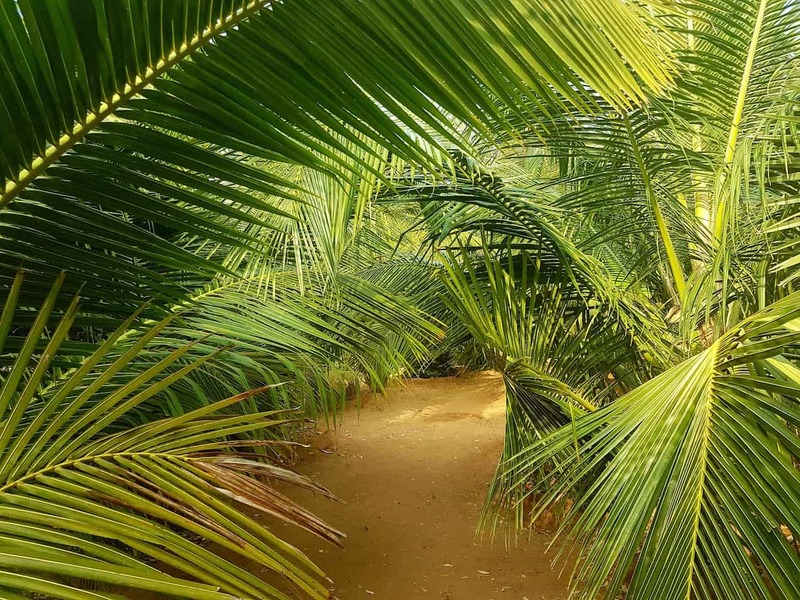 If you want to know more about budget tours in Sri Lanka read this post.